Termination of the firm as a going concern. Financial restructuring of a failing firm to attempt to continue operations as a going concern. The rule establishing priority of claims in liquidation. Get the latest on bankruptcy at www.bankruptcydata. .com. This priority list for liquidation is a reflection of the absolute priority rule (APR). The higher a claim is on this list, the more likely it is to be paid. In many of these categories, there are various limitations and qualifications that we omit for the sake of brevity. Two qualifications to this list are in order. The first concerns secured creditors. Such creditors are entitled to the proceeds from the sale of the security and are outside this ordering. However, if the secured property is liquidated and provides cash insufficient to cover the amount owed, the secured creditors join with unsecured creditors in dividing the remaining liquidated value. In contrast, if the secured property is liquidated for proceeds greater than the secured claim, the net proceeds are used to pay unsecured creditors and others. The second qualification to the APR is that, in reality, what happens, and who gets what, in the event of bankruptcy is subject to much negotiation, and, as a result, the APR is frequently not followed. 1. A voluntary petition can be filed by the corporation, or an involuntary petition can be filed by creditors. 2. A federal judge either approves or denies the petition. If the petition is approved, a time for filing proofs of claims is set. 3. In most cases, the corporation (the "debtor in possession") continues to run the business. 4. The corporation (and, in certain cases, the creditors) submits a reorganization plan. 5. 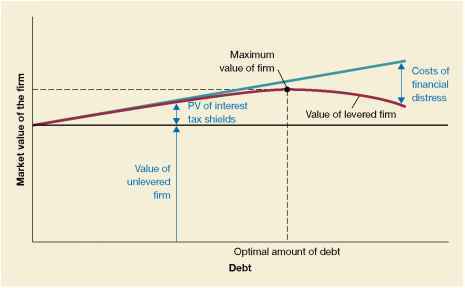 Creditors and shareholders are divided into classes. A class of creditors accepts the plan if a majority of the class agrees to the plan. 6. After its acceptance by creditors, the plan is confirmed by the court. 7. Payments in cash, property, and securities are made to creditors and shareholders. The plan may provide for the issuance of new securities. 8. For some fixed length of time, the firm operates according to the provisions of the reorganization plan. The corporation may wish to allow the old stockholders to retain some participation in the firm. Needless to say, this may involve some protest by the holders of unsecured debt. So-called prepackaged bankruptcies are a relatively new phenomenon. What happens is that the corporation secures the necessary approval of a bankruptcy plan from a majority of its creditors first, and then it files for bankruptcy. As a result, the company enters bankruptcy and reemerges almost immediately. firm was able to announce that it had struck a deal to emerge from bankruptcy and to keep operating with no interruption of service to customers. In some cases, the bankruptcy procedure is needed to invoke the "cram-down" power of the bankruptcy court. Under certain circumstances, a class of creditors can be forced to accept a bankruptcy plan even if they vote not to approve it, hence the remarkably apt description "cram down."